Equipped with a spring-loaded lens: if the lens touches the slide during the focusing process, the spring mechanism will protect the optics from damage. Robust metal bodies, which ensure their long service life even when they are used intensively in school, colleges, or medical laboratories. Features multi-coated optics and universal illumination system, which allows for viewing transparent, opaque, and translucent samples. Comes in a special protective plastic case, which protects the instrument from dust and mechanical damage. Levenhuk Rainbow 50L PLUS microscope is available in 5 vivid colors – just pick the one you like most! See Levenhuk Rainbow Microscopes in action by clicking on the Video tab on the left of this page. 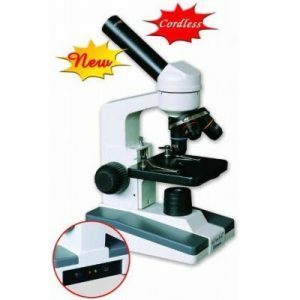 The Levenhuk Rainbow 50L PLUS Moonstone microscope makes a wonderful gift for a biology student, an inquisitive teenager or a laboratory technician. The maximum magnification power of this instrument is 1280x – just enough to see all the tiniest details of observed microscope samples. The model features a reliable, robust body which makes it a perfect instrument for at home, as well as for laboratory work in schools and universities. This model is equipped with two LED illumination systems. The lower lighting is needed for viewing transparent samples. For example, you will be able to examine the structure of a bee’s wing or detect microorganisms in aquarium water. The upper lighting allows for observing non-transparent (opaque) objects such as paper or metal. This model can also be used for working with semi-transparent objects by using both upper and lower lighting at once. The illumination systems feature adjustable brightness. Levenhuk Rainbow 50L PLUS Moonstone microscope has a very reliable, robust body made of metal. The 45-degrees inclined and 360-degrees rotatable head ensures the most comfortable use of the instrument. That is especially convenient when working in a group because you can get a better view,. Just rotate the head instead of moving the whole microscope. This microscope can be also used outside the house. The illumination system can be powered through an outlet or with standard AA batteries. 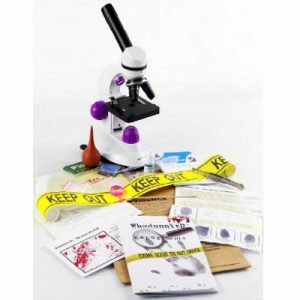 Examples of what you can see with this microscope. Click on image to enlarge.